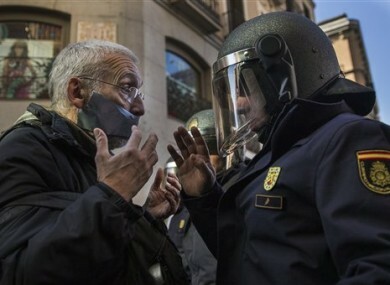 A policeman communicates with a demonstrator by a cordoned off street, during a protest against Spanish Citizens Security Law in Madrid. THOUSANDS OF PEOPLE took to the streets in many Spanish cities yesterday against a proposed law that would set hefty fines for offences such as burning the national flag and demonstrating outside parliament buildings or strategic installations. The Public Security Law was approved by one house of parliament last week and is expected to be accepted by the other government-controlled one next month. The bill has been heavily criticised by opposition parties and human rights groups as an attempt by the conservative government to muzzle protests over its handling of Spain’s financial crisis. Saturday’s largest demonstrations occurred in cities such as Barcelona, Bilbao and Madrid, while smaller ones took place in Almeria, Granada and Valencia. The proposed law would allow fines of up to €30,000 for disseminating photographs of police officers that are deemed to endanger them or their operations. Individuals participating in demonstrations outside parliament buildings or key installations would be fined up to €600,000 if they are considered to breach the peace. Those insulting police officers could be fined up €600. Burning a national flag could cost the perpetrator a maximum fine of €30,000. The protests — which saw demonstrators mingling with large crowds of Christmas shoppers in some cities — ended peacefully. Police in Madrid forced media photographers to produce identity papers. The demonstrators included groups opposed to forced evictions because the bill would levy fines of €30,000 for attempting to prevent home repossessions. Others protested an element of the legislation that would entitle police in Spain’s North African enclaves of Ceuta and Melilla to summarily expel migrants caught trying to enter Europe by storming border fences. Email “Spain wants to fine people who protest and 'breach the peace' outside parliament”. Feedback on “Spain wants to fine people who protest and 'breach the peace' outside parliament”.